Stonefields School: Knowing what to do when you are stuck! The Stonefields School staff spent considerable time dialoguing and discussing the necessary dispositions needed for the future. This dialogue was an important one as we wanted to create a shared language that is reinforced throughout the School to actively build each learners Capacity to learn. This dialogue lasted over a number of days and we are pleased with the outcome. There are seven competencies that will be intentional explored and taught to ensure our learners know what to do when they don't know what to do. One of our teachers spent the day videoing learners to capture their thoughts about what makes a good learner a good learner. From our baseline we can see we have some work to do. Having interviewed hundreds of students using similar questions the responses are quite disturbing as often children will say ‘I don’t know’, ‘pick up rubbish’, ‘do what the teacher says’, ‘sit quietly on the mat’, and ‘listen’. Deep and engaging learning is not about being passive or being good, it is about engaging and knowing what to do when you are stuck in your learning. 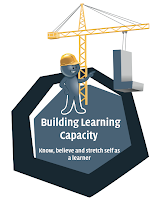 We look forward to focusing deeply in the next few weeks on ensuring our learners understand more deeply what it is to be an effective learner.